My too short time spent in Konstanz was split between a lot of sightseeing, intensive country hopping and long walks near the shore, but equally some surprising foodie discoveries. Shortly upon arrival, after a 10-hour bus journey from Berlin, we arrived in the historical area, not only curios to know our host city, but also desperately looking for some 'normal' food other than sandwiches and bretzels. We decided to stop at Antico Borgo, opposite the famous cathedral where the Konstanz Council started 600 years ago. With the musical company of the street musicians and while observing the slow motion of people taking their evening walk, I ordered some homemade gnocchi with salty gorgonzola sauce (gnocchi a baccio) and a fresh lemonade that fed the thirst. 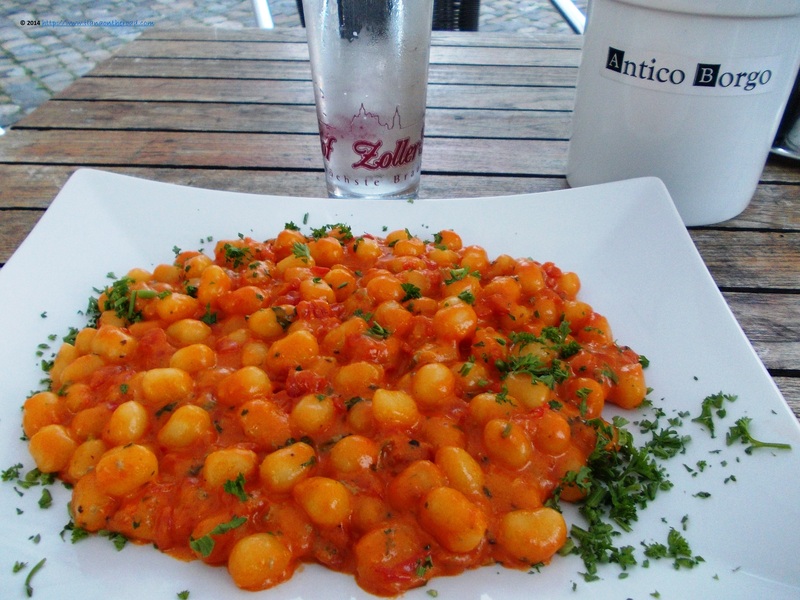 The sauce was a bit salty, but the silky gnocchi were well made and the portion big enough to silence the hunger. Although we preferred to eat outside, there were enough place indoors too, and the place was nicely decorated, with white chairs and big bottles of wine gazing to the visitors from the walls. Breakfast is the most important meal of the day for me, and especially when I travel, without a good start I worry for the successful outcome of the rest of the journey. Lucky me that I discovered in the central area, close to the train station, Panno a hip eatery preparing on the spot various sandwiches and serving a very strong coffee. 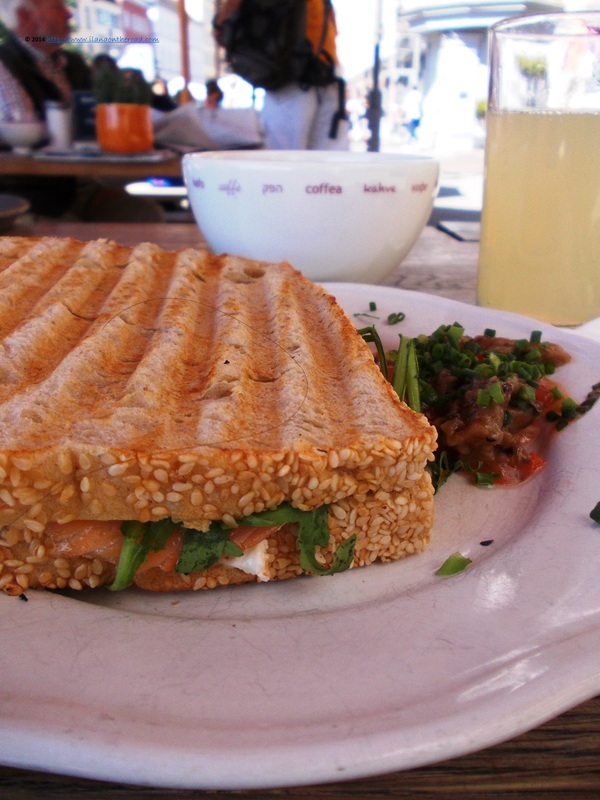 My favourite sandwich was matching the watery spirit of the town: salmon with watercress, horseradish in a tasty sesame bread. I tried once again the lemonade and as in the previous case, I was not disappointed. The place is usually crowded, with long lines of people, tourists or locals, waiting for their morning treats. 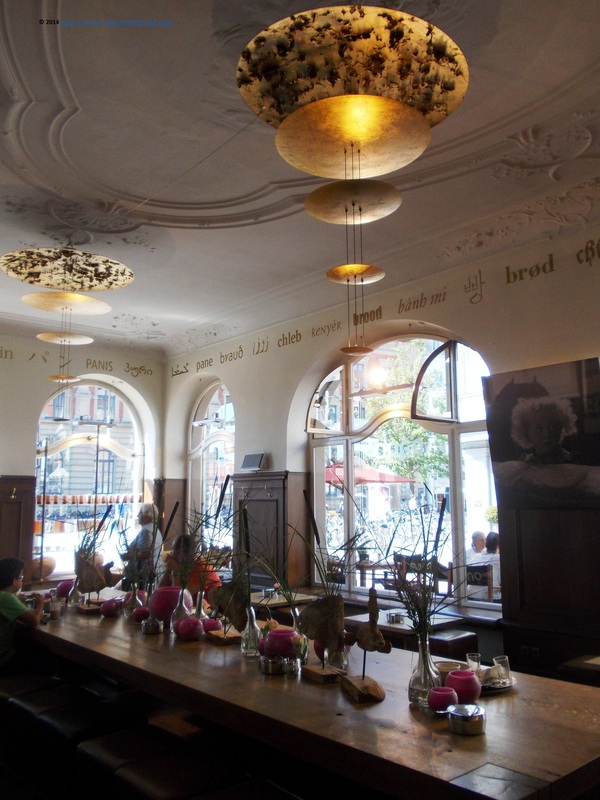 The interior is decorated in a modern way, with long massive wood inviting tables and colourful flowers brought to bring more sweetness to the serious note of the environment. After a long journey in the island of flowers, we returned in the city very hungry, but interested in eating something special. On a small street we discovered Radieschen, on the market since the beginning of the 1980s. Eating outside is strongly recommended as the interior doesn't look very tempting, with worn out furniture and not too attention paid for the interior design. The service was a bit slow, especially given our hunger, but the results were satisfactory. 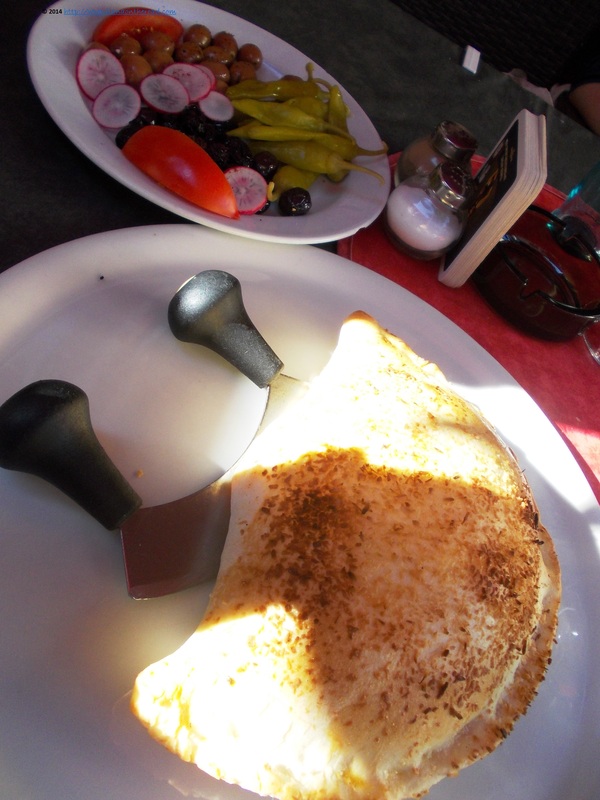 We started with a salad, with olives, radishes (the name of the restaurant), (too many) peppers, followed by an atypical borek, with cheese and apricots filling and coconut crust. The borek dough was smooth, but the big portion needed to be cut with a special knife fit to reach both ends. 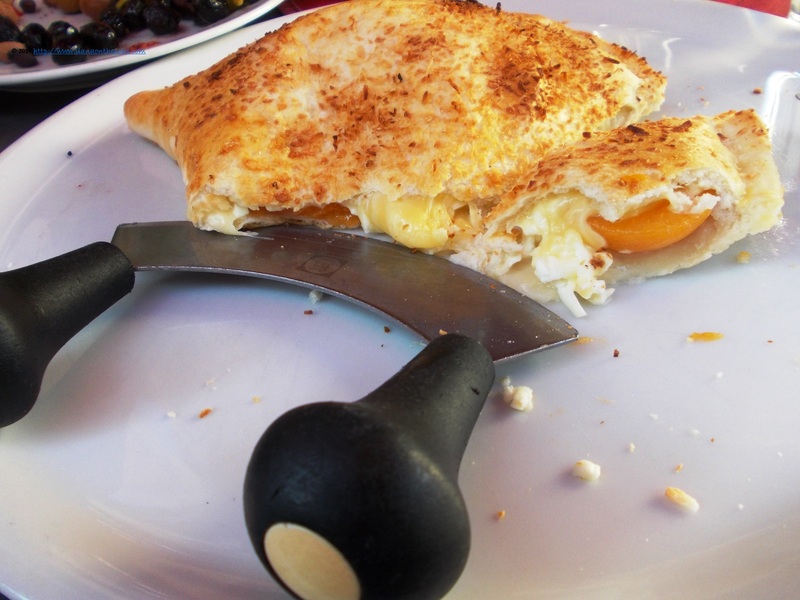 The combination between Gouda, apricots and coconut was unusual, and sometimes the salt of the cheese was predominant, as the apricots lost their freshness during cooking. The water helped to bring the taste balance back. Overall, it was an interesting choice of dinner. Long before we arrived in Konstanz, I made the wish to stop-by at Hotel Halm, one of luxury destinations in town. It was open in 1874, 9 years after the opening of the train station, whom it faces. 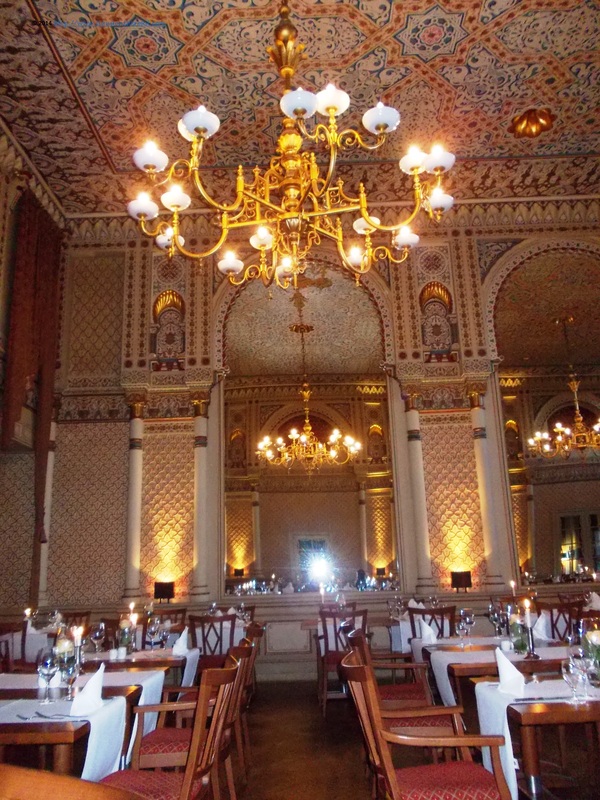 The predominant style combining classicism and neo-Renaissance turned recently into a more Oriental direction, as it proves the Moorish Hall where we stop for a sweet treat in the evening. The huge hall invites to reflection and meditation, encouraged by the exquisite musical background and the elegant care of the service. in a special ambiance of 1001 Nights. 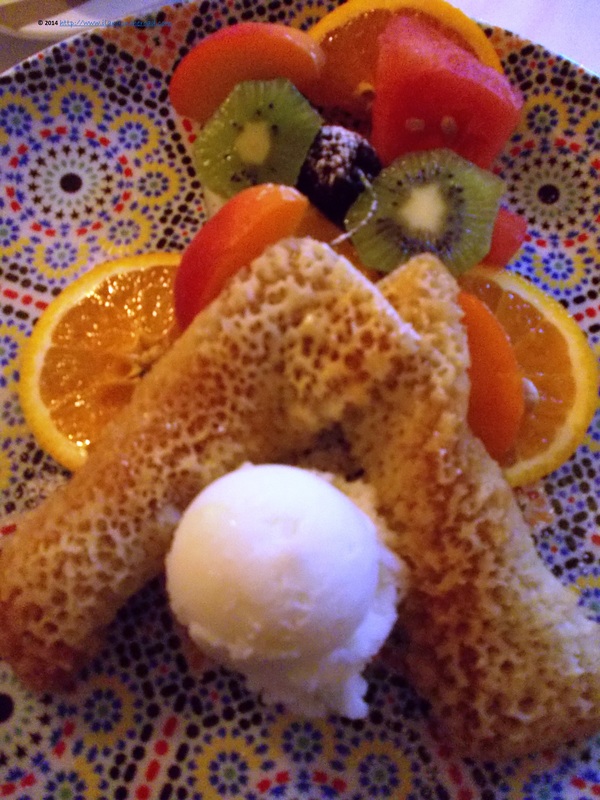 In such an overwhelming ambiance of elegance, I felt a bit intimidated, not sure what I want to order from the leather covered menu, but finally made up my mind and decided for a matched exotic combination: almond pancakes with honey soaked in orange water and lemon icecream. Till the treats arrived on a plate matching the wall decorations, I was pleasantly impressed about a very small detail: the water was brought exactly at the room temperature. The coffee was elegant, as strong as I expected. The sweetness of the pancakes was successfully challenged by the combination of fruits at the room temperature a choice that kept them fresh: kiwi, cherries, apricots and oranges and refreshed by the neutral taste of the icecream. It seemed that every single bit was made to experience an explosion of sweet smells and exotic tastes. For the farewell dinner, I chose Mato Restaurant, offering mostly minimalist dishes. The couscous with caramelized pecan nuts, a slice of goat cheese and various salad leaves slightly salted and with discrete traces of oil was a good cocktail of moderation. 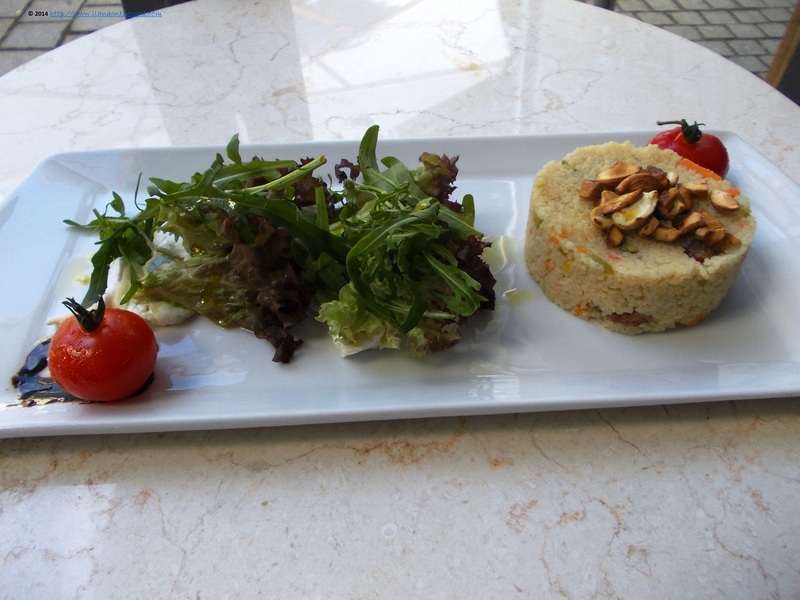 Maybe the couscous, with some small pieces of carrot inside, had a bit too much moisture and the tomato was overcooked,but the overall impression was of a promising idea. 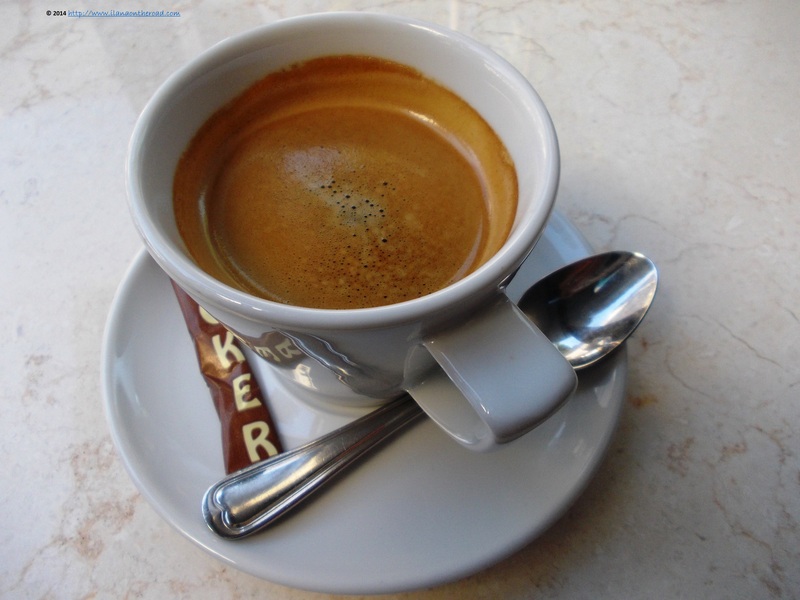 The service was a bit slow, but the coffee was tasty and energizing. On a side note, it seems that Konstanz is a place where people love to have and know how to prepare some serious good coffees, exactly my kind of humans not easy to find in the old Europe. The pop-art kind of interior decoration was interesting inside, but the furniture for the outdoors was a simple garden type, with colourful cushion to make your stay a bit more comfortable. 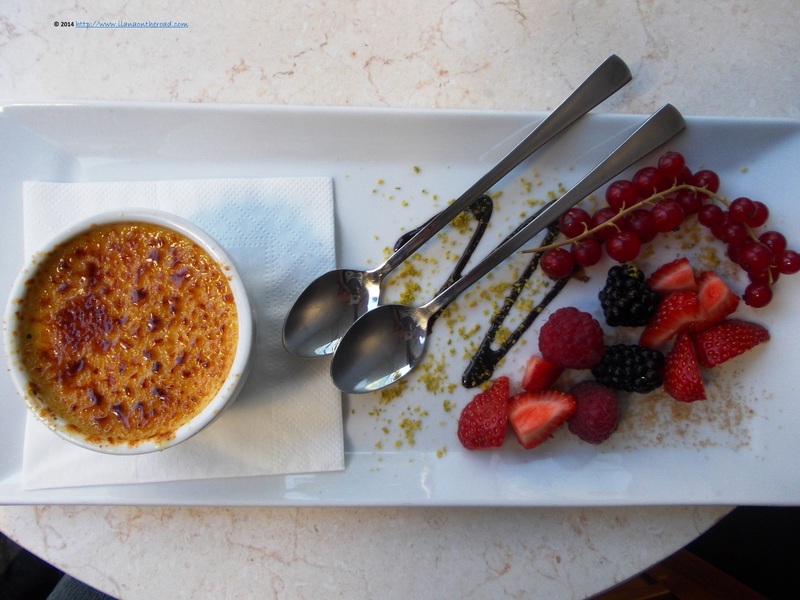 I do have a secret plan to taste as many types of crème brulée as possible and couldn't waste my time not including this delicious meal on my foodie tasting in Konstanz. This one was with lemongrass and a combination of fresh fruits: raspberries, strawberries, blackberries and Johannisbeeren (the kind of fruits that I will never come along with, given its sourness). The fruits were not cold enough, but tried to taste each of them with a little bit of crème. Most of them matched (except the Johannisbeeren) the cream, inspiring for more foodie ideas for my own culinary experiments. Konstanz seems so far away right now, but after looking once again to the pictures and trying to remember the tastes, smells and texture of the food, I felt compelled to book a new trip in the new future. I bet there are many more foodie temptations hiding somewhere on the old streets.